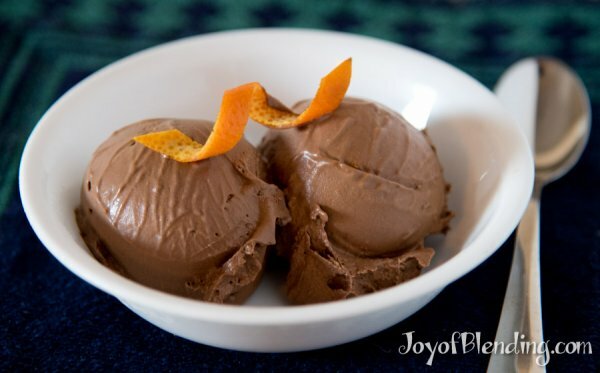 This chocolate orange ice cream recipe is based on my favorite flavor at Mr. Dewie’s (Mr. Dewie’s specializes in dairy/soy-free cashew-based ice cream). I’ve made nut-based sorbet/ice creams before, but those centered around the nuts (pistachio, honey peanut, and maple pecan). Cashews have a much milder flavor, which opens up a wider range of possibilities. I think chocolate and orange complement each other well, and this ice cream is fragrant with a nice chocolate depth. Meanwhile, the protein and fat from the cashews provide a satisfyingly substantial and creamy body that rivals a traditional ice cream. I’m trying to figure out how to compare this to the pure chocolate sorbet that I made a while back, which only relies on chocolate for the body of the sorbet. You could of course add orange extract to that recipe, and I think it would be good. I would say the pure chocolate one is more intense, while this recipe is more balanced, and closer to an ice cream. I think the blended cashews also help the texture. The alcohol from the extracts in this recipe may also improve the scoopability of leftovers. I used the Mr. Dewie’s ingredient list, which includes a couple of slightly unexpected ingredients. I’ve made both the full recipe and a more stripped-down version without the ingredients marked optional. The full ingredient list provides a slightly deeper flavor, which I preferred, but both were excellent. I made this as a twice-blended Vitamix ice cream (blend, freeze, then blend again). It doesn’t freeze completely rock-hard, so you could make it as a no-churn ice cream, in which case you would just blend once and freeze (taking it out and stirring it every 30–60 minutes could help if you do it that way). I do think the second blend makes for a slightly better texture though. You could also freeze it in an ice cream maker, but I like not having to own an ice cream maker. This recipe is designed for a narrow Vitamix container with 3″ blades. If you only have a wide 64-oz container, I recommend making at least 1.5x this recipe. Soak the cashews for at least 4 hours. If soaking longer than 4 hours (like overnight), I’d soak in the fridge. Drain and rinse cashews, then blend all ingredients on high for 90 seconds. Pour into ice cube trays and freeze (I often do this overnight). Then pop the frozen cubes out and blend on high using the tamper until it starts circulating. If it is softer than you like after the second blend, put it in the freezer for 20–40 minutes to firm it up. When blending ice creams and sorbets, I like to pre-chill bowls and a storage container in the freezer. That way, once it’s blended, you can immediately transfer to a cold container so it stops melting. Leftovers will also be better if they didn’t partially melt in the container and then re-freeze. In principle you could use orange zest instead of the orange extract, but I think that would be less consistent, and could also be bitter. I used an orange extract in alcohol from Penzey’s, and it worked well. The coffee and chocolate extract add to the depth of the chocolate flavor. (I used cold-brewed coffee.) You could also use single-strength coffee and adjust the amount of water. The coffee flavor is subtle enough that I don’t think you’d know it had coffee without seeing the ingredient list. You can also add chocolate chips for an extra chocolate boost, which is what Mr Dewie’s does, but I’m enjoying this smooth version without chocolate chips. This is really ironic because I’ve been thinking the chocolate-orange combo for the last few days now! It looks delicious and I’ll be trying it soon. I’ll sub coconut water and orange juice for the water and coffee, though. This is truly delicious. Everyone should try this, and once you’ve tried it, get adventurous and try some variations! That’s what I did today, inspired by the basil plant on my kitchen counter. Yes, I substituted basil for the orange extract, and the result was, as they used to say about Almond Joy candy bars in my youth, “indescribably delicious.” Basil and chocolate make for a surprising and wonderful combination; I increased the vanilla to 2 tsp, kept the coffee, and omitted the chocolate extract (because I didn’t have any). I used about 12 big basil leaves. Otherwise I followed your recipe exactly. It was fabulous. And the best part is that there is still some in the freezer for later. Sounds interesting! I don’t think I’ve ever had basil with chocolate before, but I can imagine that it would work. Mary, you’re inspiring me to new culinary heights! I imagine (keeping the orange) that a lavender leaf or two would be good. And let’s not forget mint–I understand there’s even a lavender cultivar, although I suspect the chocolate would be a good partner for this.